I have been trying a lot of foods lately that I wasn’t able to eat before, and they have all been a great success. Mostly I’m trying vegetables and spices since I’m going to continue to eat healthy from now on, but I did splurge on pizza for my birthday with no consequences! I really think my fructose malabsorption is gone. I don’t really want to take the test again, since I’m afraid of that liquid fructose you have to drink, but I’m curious. Would anyone else want to know if my FM is gone? This is one of my favorite treats and I eat it daily. Cashew bread is an excellent bread alternative. 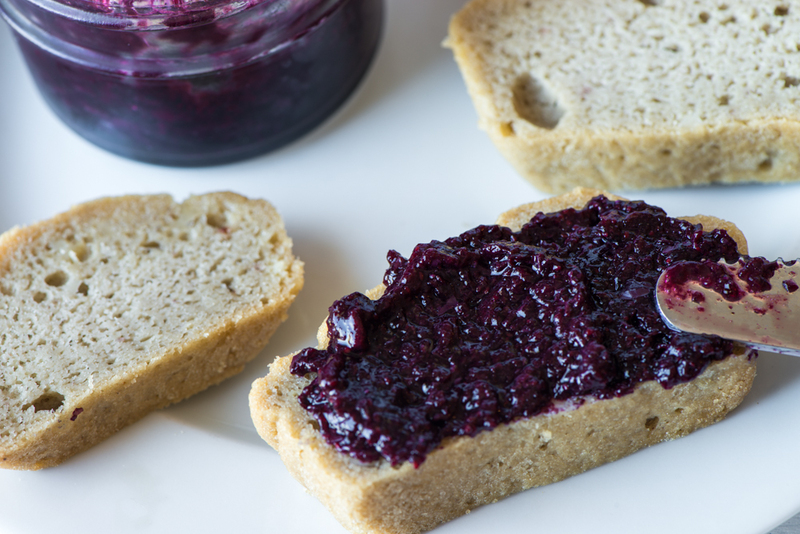 The texture is like a cross between white bread and cake, so it lends itself perfectly to jam. You can use any kind of jam you want, of course, but I like blueberry because I don’t have to add any sugar to it. Also there’s a lot of pectin in blueberries, so you don’t need a lot of gelatin (but gelatin is good for you so this isn’t actually a plus, it’s just kind of cool). This recipe is for two loaves. You can use a regular bread pan, but I like using two of these. It makes it really easy to pack for lunch. 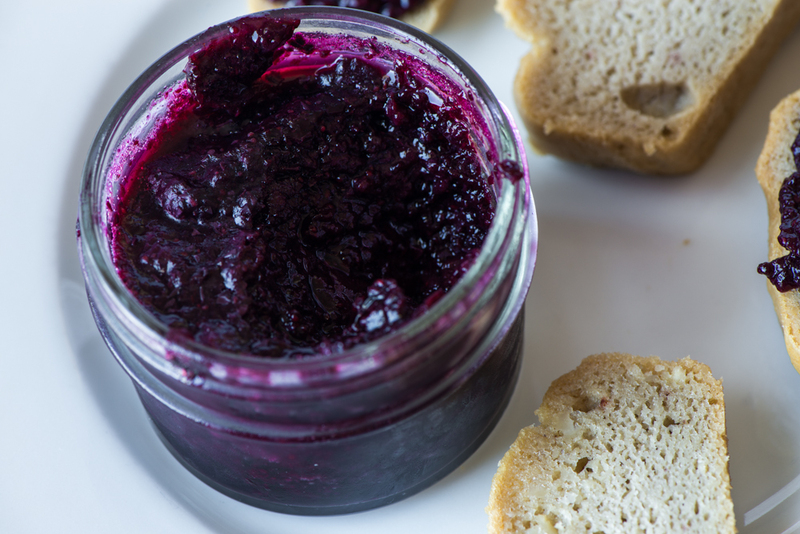 Make sure you make the jam first, so it has time to firm up before you use it. I usually do it the day before. Wash blueberries and blend together with lemon juice in a food processor. 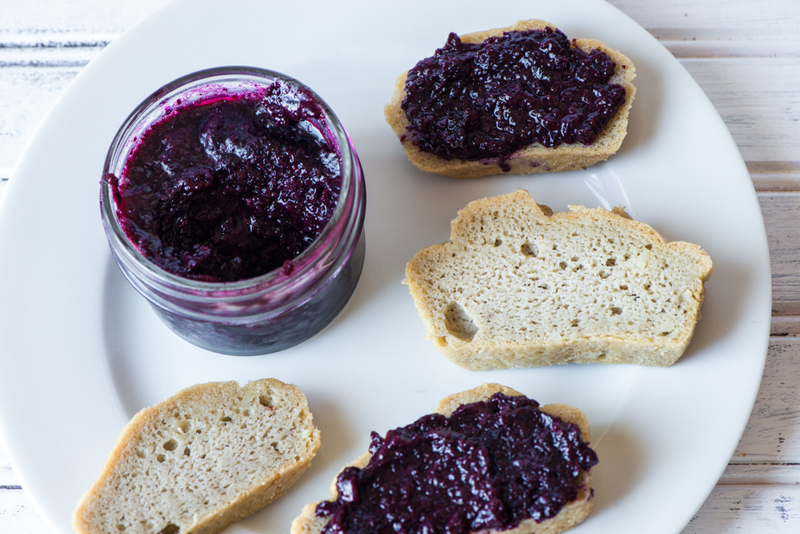 Thoroughly mix the gelatin in the blueberry puree in a small pan and let sit for 10 minutes. Put over high heat and mix until gelatin is dissolved (usually when the jam is heated through). Poor into jars (I like these) and cool in the refrigerator. In a food processor, chop up the cashews. Put the eggs and water into a measuring cup. Add the baking soda, tapioca starch, and salt to the nuts and turn on the food processor. Slowly add the eggs/water until everything is smooth. Add evenly to your bread pans. Bake for 50 minutes and then let cool on a cooling rack for an hour. This entry was posted in Recipes and tagged blueberries, bread, cashews, fructose malabsorption, jam, Paleo by nosugarlessgum. Bookmark the permalink.